Tuna definitely has a distinctive look - that goofy smile is what made this 4-year-old rescue "chiweenie" such a beloved social media celebrity! 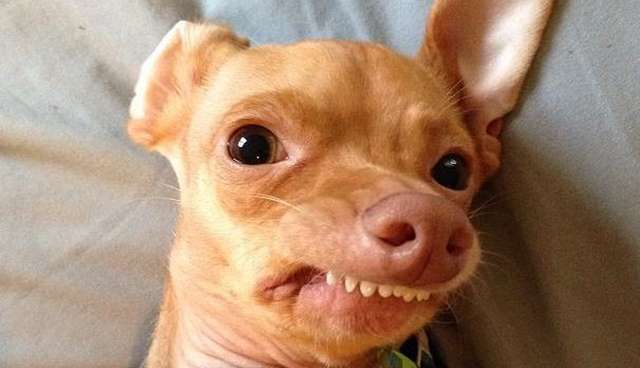 The little dog with the big overbite has an astounding 1.3 million followers on Instagram, and he's putting his celebrity to good use as an advocate for shelter dogs and rescues. Tuna's devoted human, Courtney Dasher, maintains his super popular Instagram account and Facebook page, bringing daily doses of Tuna's hilarious personality to his many fans. In an article she wrote back in in 2013, Dasher explained how she fell in love with the little guy and his quirky look. Tuna was only 4 months old when she met him. He had been found abandoned on the side of the road, and Dasher was looking to foster a puppy. But she soon realized that Tuna was meant to be a permanent family member. "I had fallen in love with him and I wanted him to know how much he would be loved by me," she wrote, adding that it broke her heart when people called him ugly. "They judge him by his looks, but if they knew his heart, they would find him to be so beautiful." Dasher started Tuna's Instagram account as a way to show off his beautiful spirit, and soon he was more popular than she could ever have imagined. He's even been on TV. Now he advocates for rescues, especially dogs who might not fit everyone's idea of what a pet "should" look like. When Tuna's not busy helping out shelter dogs who need homes, he's usually napping with his human or snuggling with his toys. Tuna is especially cute when he's having playdates with his doggie friends. Thanks to his human mom, Tuna is getting the chance to love, play and snuggle like every dog should. Unfortunately shelters are crowded with pets who are just waiting for a family to give them the life they deserve. The world would probably be a much better place if we could all be a little more like Tuna - live hard, love hard, nap hard ... that's the way to do it.